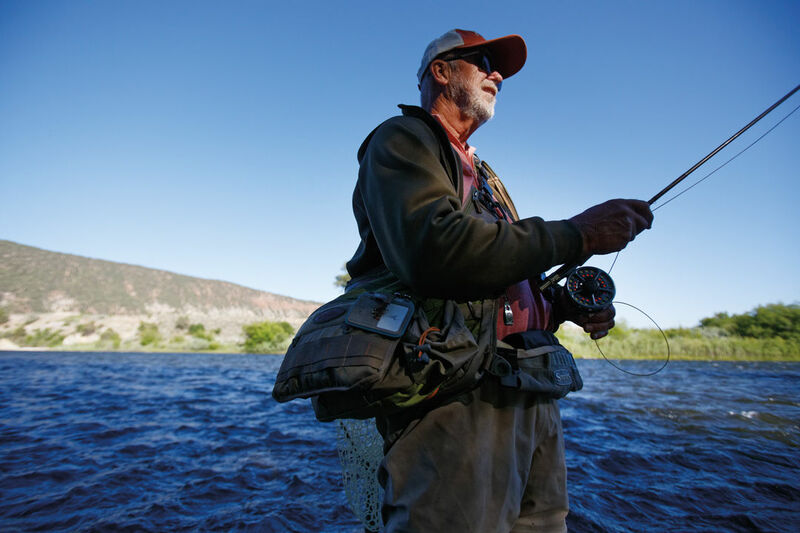 Fish stories to inspire, gold-medal status, and luxe angling trips. Tim Heng on a surprisingly wild section of the lower Roaring Fork River between Carbondale and Glenwood Springs. Fourteen miles of the Fryingpan River (below Ruedi Dam) and 24.7 miles of the Roaring Fork have earned Gold Medal status, a designation bestowed by Colorado Parks and Wildlife to recognize streams that support lots of trout—including big’uns. Gold Medal water must contain 60 pounds of trout per acre, and at least 12 of those fish must measure 14 inches or more. 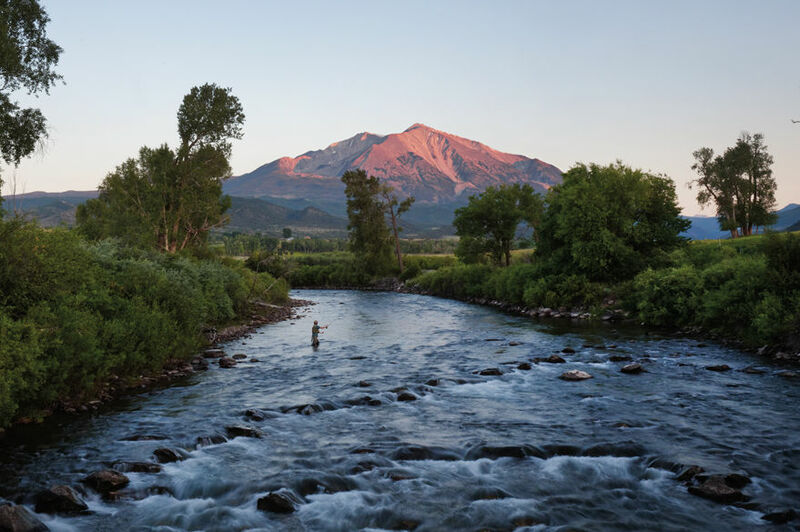 The Roaring Fork was the longest stretch of Gold Medal water in the state until 2014, when a 102-mile portion of the Upper Arkansas River nudged it out of top place. Additionally, 7 miles of the Roaring Fork from Hallam Lake in Aspen downstream to the Upper Woody Creek Bridge are also designated as Wild Trout Water, meaning they contain healthy populations of wild fish and aren’t typically stocked with hatchery fingerlings. 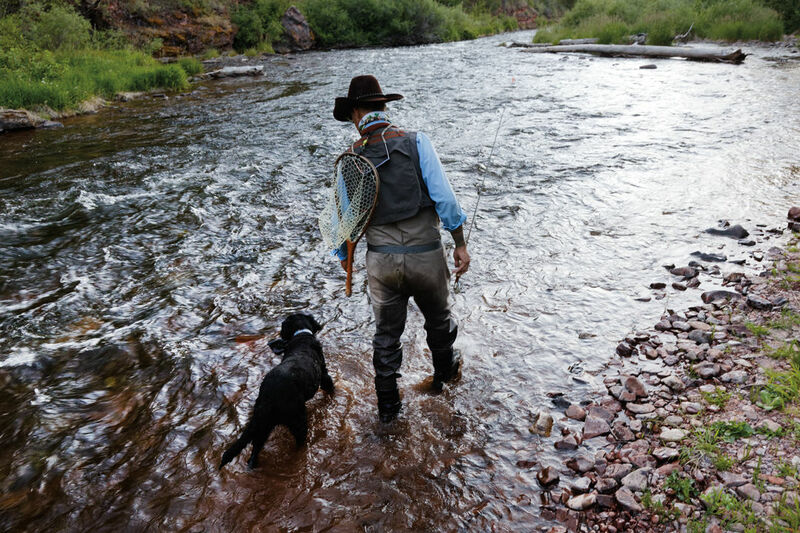 Blue Ribbon streams are designations issued by the federal government and other states (such as Utah and Montana) to celebrate outstanding fisheries—so nationwide, you’ll hear about Blue Ribbon rivers, while Colorado prefers the Gold Medal terminology. “The green drakes are the best-known hatch in our valley, and they’re one of my favorites. They’re big mayflies, almost an inch long, and when they hatch, they just cover the water and the whole river wakes up, with trout rising all over the place. Most of the year, these fish feed on teeny-tiny little midges, so when that big bug hatch happens, trout just go crazy for them. Most of the time, though, the hatch happens in the evening, right as it’s getting dark. So not only is the green drake a unique bug, but it also requires a unique way of fishing. One time, I brought my friend Frany. It was in July, when the hatch was hitting Basalt. We headed to Gerbaz Bridge, and even though there were already a few other anglers there, everyone was friendly. That’s the way it is with the green drakes. People stop being grumpy and territorial and just get excited about the hatch. They share fly patterns and talk about what’s been working well. It’s a fun vibe. It was getting darker and darker as we waited for the hatch to start, and Frany kept asking, ‘You sure this is actually going to happen?’ Finally, around 9 or so, the ‘power hour’ turned on. But by then it was almost too dark to see, so you have to listen for the take and set the hook by sound, not by sight. Fifty percent of the time, you get a fish. 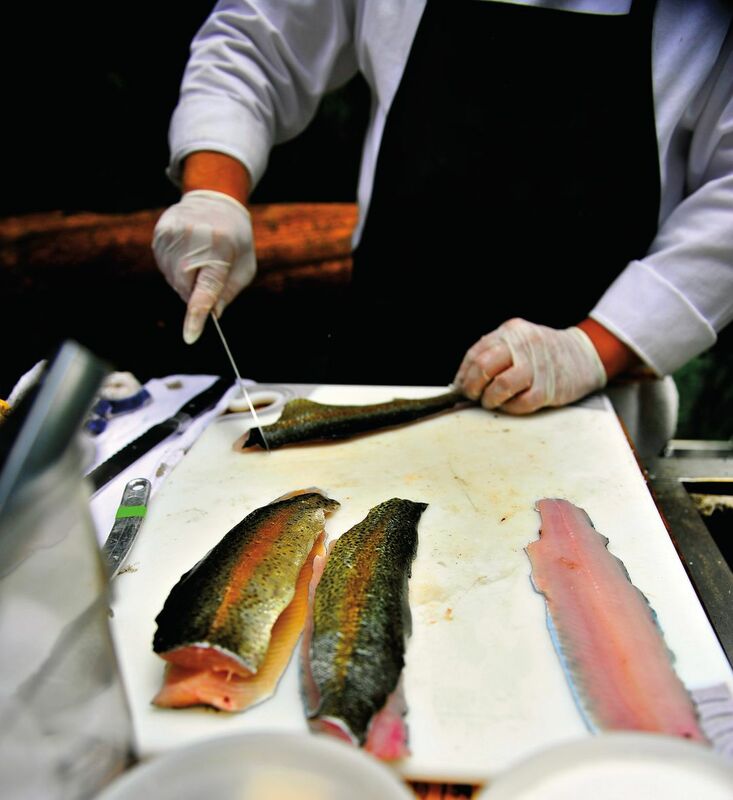 A Little Nell chef preps fresh trout. Bar ZX Ranch sprawls beneath the Ragged Mountains, which prove that wrinkles can, indeed, be beautiful. Their chiseled flanks rise above a chain of mountain lakes that grow monster-size trout. Here, a 5-pound rainbow occupies the small end of the spectrum, while 20-pounders fight like sharks and bend fishing rods into horseshoes. 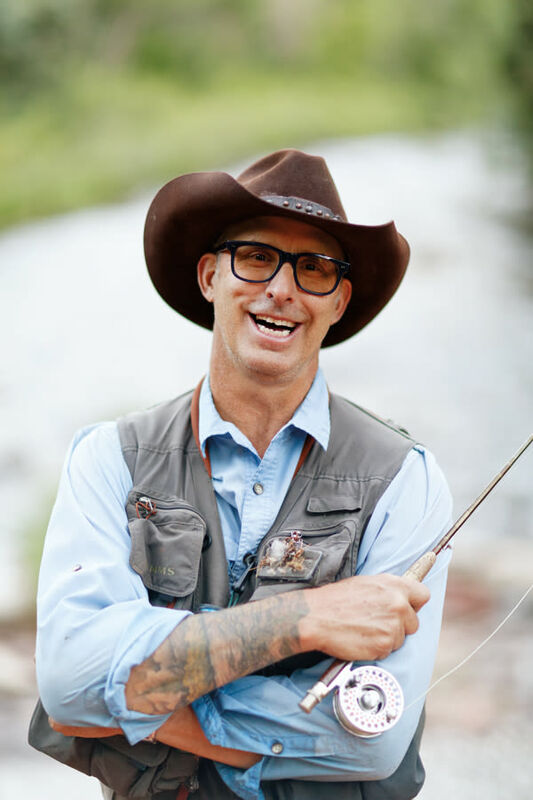 But the property sits some distance from Aspen—90 minutes by truck—so The Little Nell offers heli-fishing trips that trim the commute to 15 minutes. They also showcase the nest of glorious peaks that separate Bar ZX from Aspen—the Raggeds and the Elk Mountains, all dotted with lakes that look like blue opals when viewed from above. A passion for fly-fishing drew John Hollinger to Aspen in 1968, and the following year he launched Aspen Outfitting Company, which started leasing exclusive fishing access from local landowners on the Roaring Fork River upstream of Basalt. Now, Hollinger’s son Jared runs the guided fishing and hunting business, and maintains many of the same relationships that Hollinger first forged back in the ’60s and ’70s. “It was spring, and I was fishing the middle section of the Fryingpan at Folkstad Spring. A lot of anglers avoid that faster pocket water, but I love it. I saw a fish on the other side of the stream, in front of a big boulder. It was almost porpoising, rolling onto its side and sipping bugs. So I tied on an RS2 behind a small 18 Adams and high-sticked my rod over the current. That fish took it and just sunk to the bottom. Next he made a big jump upstream, into faster current, then downstream. Following him took lots of tricky maneuvering, because there isn’t much of a bank. The river is narrow there and full of boulders, and I had him on light 6X tippet. I’m sure I fell, but I don’t remember it—I was just so focused on getting my fish, I didn’t even care if I cracked my shin. Eventually I caught up with him, lifted my rod, and scooped him up just as the tippet was about to snap. These five cool pools are home to plenty of trout, but consider yourself warned, most require sweat effort to get to them. 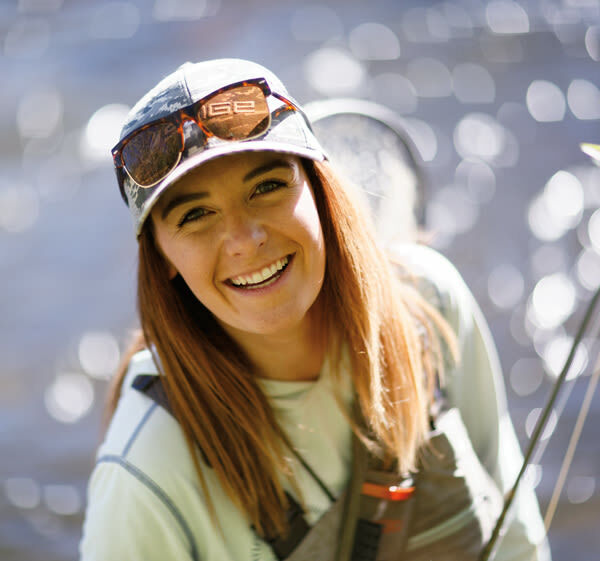 With so many options, fishing is a year-round pursuit in the Roaring Fork Valley. 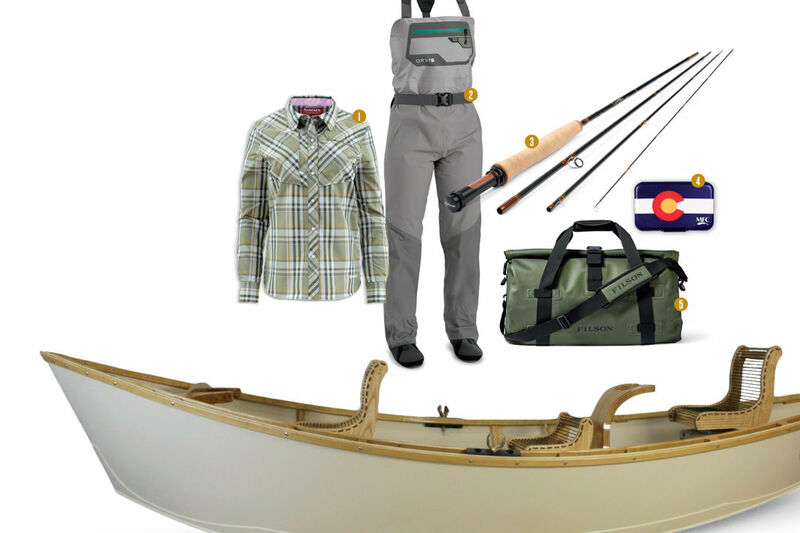 Here's what you need to catch fish, and stay comfy while landing them. 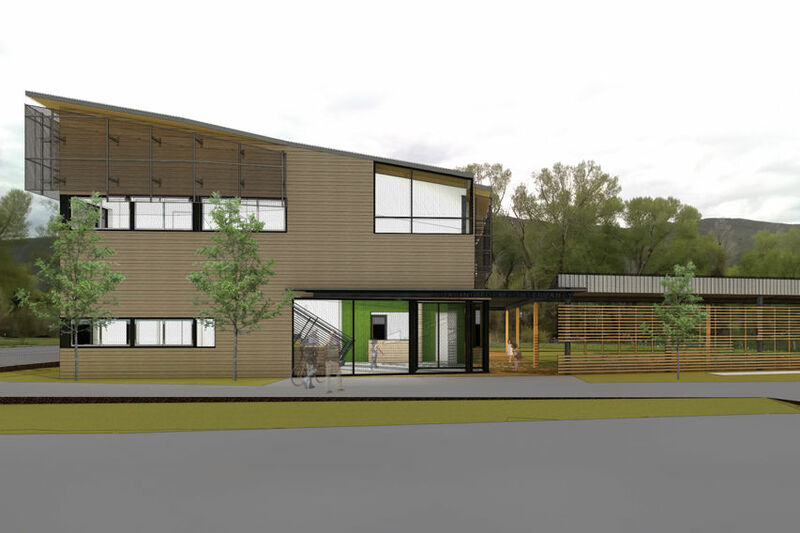 This long-anticipated home promotes appreciation for healthy streams through a unique, river-inspired design.